'Cause I've got boatloads of quobesity for you to wade through. Today's steam rises off a new product (not surprisingly endorsed by the Heart and Stroke Foundation's mis-information program's Health Check) called YoPRO. Basically it's frozen yogurt with added protein. "AT LAST, ICE CREAM IS A HEALTHY AND BALANCED SNACK!" 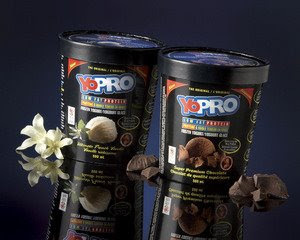 "As protein, calcium, potassium and iron, which are found in YoPRO, have been studied for many health benefits, this super premium, guilt - free indulgence is the perfect snack". "Is YoPRO high in calories?" "When looking at calories, it is important to look at where your calories are coming from. Are you getting any nutrients from those calories and is there a balance between carbohydrates, protein and fat?" So I guess these magic health calories won't contribute to weight at all because they contain "balance" and "nutrients"! So bottom line, if you think feeding yourself or your kids ice-cream as a snack is a good idea you might as well feed them YoPRO. On the other hand, if you think that perhaps there are snacks healthier than ice-cream, perhaps you should try something else.